Sunday, the day started badly. Before I tackled my next challenge, I decided to take my breakfast tea into the sitting room to catch up with the news on the radio. As I had been doing for the last week, I had made my tea in my lidded, plastic, container. For some reason, I didn’t check thoroughly enough that both lids (pouring hole too) were closed tightly. After a couple of tentative crutch-steps, I felt a hot feeling around my crotch. Yes, you guessed, the container had tipped onto its side and the hot tea was emptying out into my cotton bag! Eeeek! I managed to untangle myself from the bag and put it on the counter where it spewed out all the liquid, flooding the work top. I needed to react quickly, but this is really difficult when you’re on crutches! As you quickly learn, wet tiles can be lethal if you’re on crutches because, despite the rubber stoppers on the bottom of them, they can skid from under you. So I dumped the bag in the washing up bowl, grabbed a tea towel to mop up the work surface and a towel for the floor. Then the bag and towels had to join the other sundries in the washing machine to be washed. Would be lost without my little peg bag, which was invaluable to transport necessities backwards and forwards from kitchen to sitting room and back. 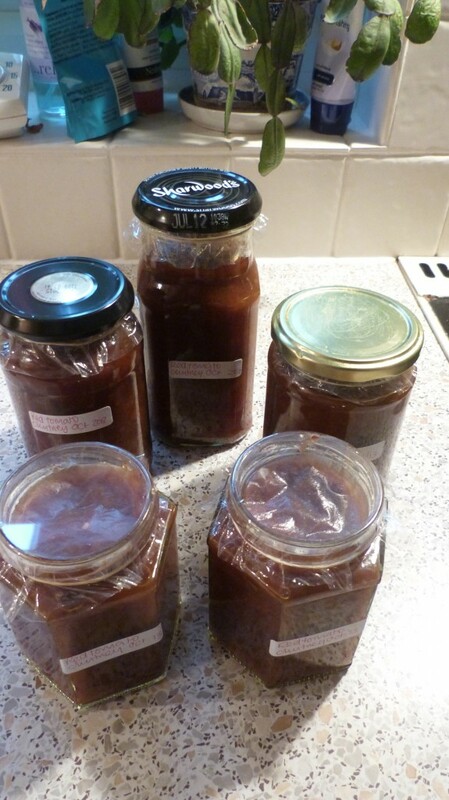 After all of that excitement, I had to get on with the chutney. So, as I didn’t want to perch on one leg while I was chopping tomatoes, apples and onions I transported, chopping board, breadknife and everything except for the onions in a variety of plastic bags to the dining room table. Bit paranoid about carrying my French cook’s knife in my little bag, while on crutches, so chopped up the onions in the kitchen. 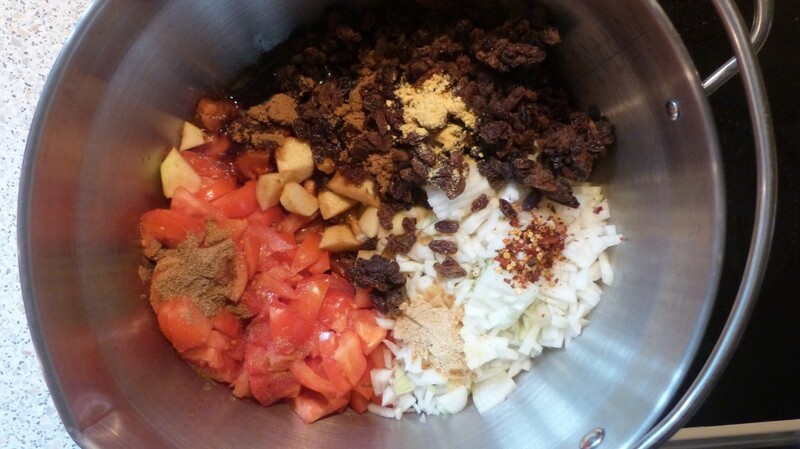 Mix the tomatoes, apples, sultanas and onions in a large saucepan. Stir in all the remaining ingredients, adding a generous sprinkling of salt and pepper. Bring slowly to the boil then reduce the heat. Simmer gently, stirring occasionally, for an hour and a half, or until thickened. 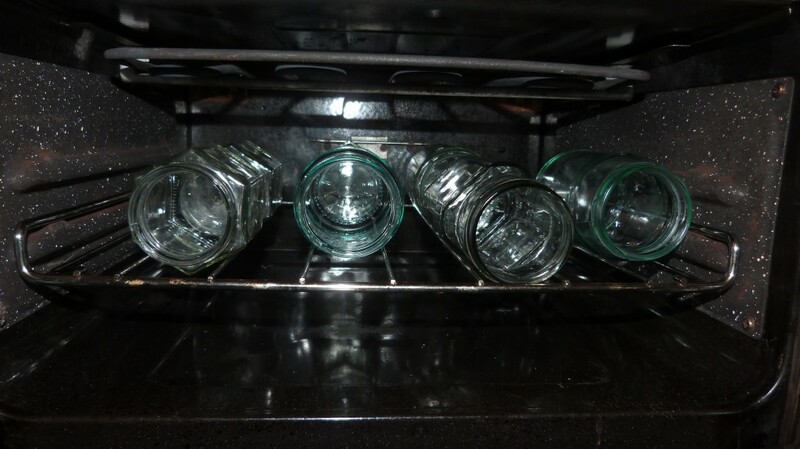 Sterilize your jam jars in the oven. 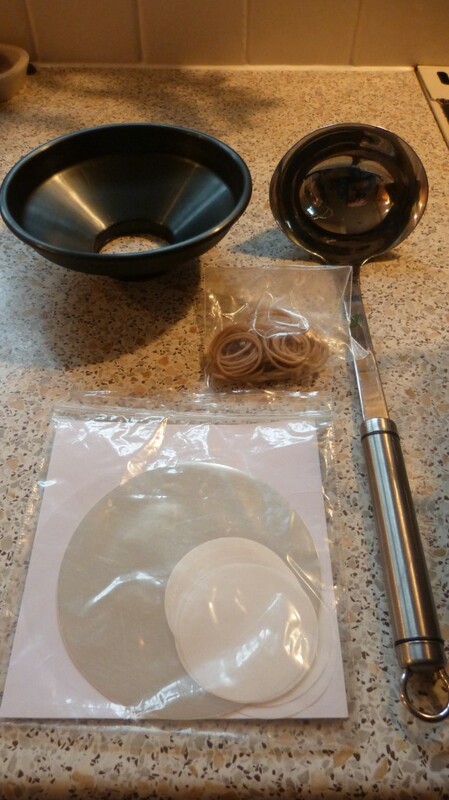 You will need a ladle, funnel, waxed discs, cellophane covers, elastic bands and labels. 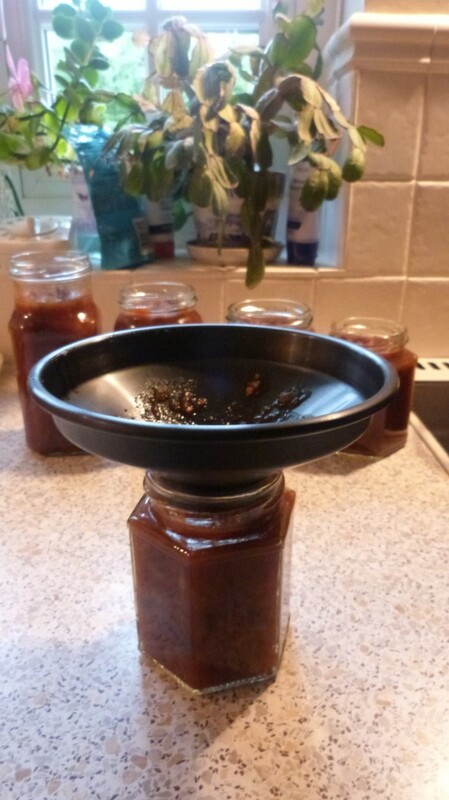 When you start potting up, it really makes life much easier if you have a jam/chutney funnel, otherwise it can become very messy, which I initially found out to my cost! 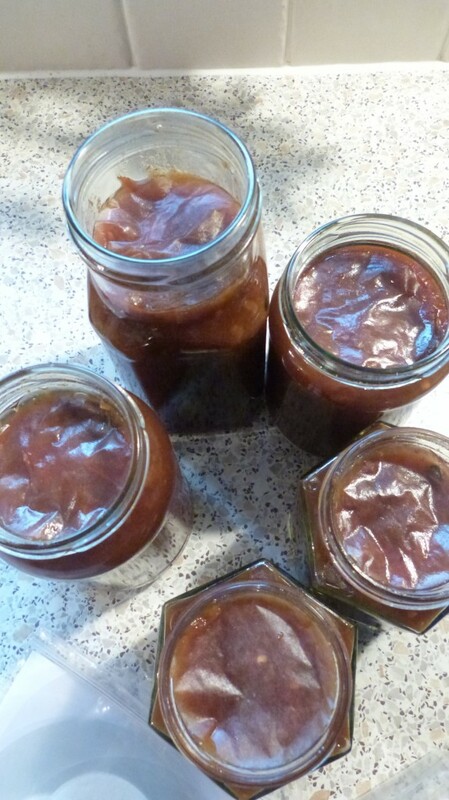 Once potted up, place the coated side of a little disc on the top of the chutney, pushing out any air bubbles to ensure 100% contact with the chutney. While the chutney is still hot, moisten one side of a cellophane disc and secure it, wet side down, on the top of the jar with an elastic band. The heat rising from the chutney will dry the cellophane and it will tighten across the top of the jar. Finish off by securing with the jar’s metal lid. The lid helps to stop the chutney drying out, thus extending its shelf life. 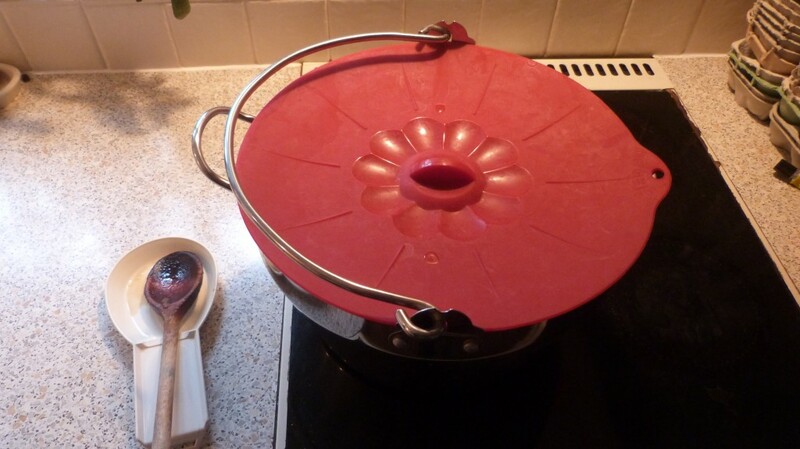 If you don’t have a metal lid to fit, cover with a double topping of baking parchment or greaseproof paper. Covered in this way, the chutney top will dry out more quickly than when covered with a metal lid. But I’m talking about after being on the shelf for longer than 6 months. Hopefully your chutney will be eaten up long before that! Phew, that was quite a challenge, but I felt so much better having done something constructive rather than sitting around all day with my leg up, eating chocolates! Later on I left the house for the first time for over a week as I was invited over to supper with some friends, who came to pick me up. I had a really lovely evening, great food and great company and even a little tipple! When dropped off, I hopped over to see Max in his stable for the first time in nine days, with a pocketful of minty goodies. Did he whinny to welcome me? Softly nicker into my ear? No, he totally ignored me and was more interested in nuzzling my friend’s face! It was quite obvious he was paying me back for not going out to give him his ‘goodnight carrots’ for over a week. What a snub. Little monkey. Next challenge? Changing the bed! This entry was posted in Kitchen by Country lover. Bookmark the permalink.